Similac Pro Total Comfort Non-GMO Infant Formula has been called miracle milk, as it can soothe even the fussiest, gassy or colicky babies. If you are having these problems I definitely recommend giving this a try. However, it may not be right for every child. Read on to see what I mean. Bonus: I know how expensive this formula can be… It is a lot cheaper if you buy through Amazon and click the “Subscribe and Save” checkbox. The Similac Pro Total Comfort Non-GMO Infant Formula has pretty stellar reviews across the board. It is well loved and received by most babies even though some have bad reactions to it. There are enough reviews to give you a pretty good sense of how well this product works on the whole. Similac Pro Total Comfort Non-GMO Infant Formula is designed to meet every nutritional need your baby could ever have. It has protein, carbohydrates, healthy fats, vitamins and minerals. The formula is designed to mimic breast milk and provide your baby with everything she-he’ll need to grow healthy and strong in their first year. This formula is also fortified with iron powder which is essential for their blood cells and brain to develop properly. Though the ingredient list can seem a little daunting all of the ingredients will support your baby through their first year with you. Our Best Baby Formula article has baby formula choices that work even better than Similac Total Comfort. Similac comfort formula recently switched all of their products from genetically engineered ingredients to only Non Genetically Engineered (Non GMO) ingredients. While they have the same ingredients they are no longer using products that have had their DNA altered or spliced together. Genetically altered ingredients can contain more nutritional value, grow more easily, be more resistant to diseases or be better in other ways. However, with these alternations come certain risks like unknown allergens being introduced, the chemical makeup of the food source being unstable or other side effects that may not be obvious since no testing is officially required. A lot of parents also prefer their baby food to be as natural as possible so this switch to Non GMO ingredients is definitely a huge selling point of Similac Pro Total Comfort Non-GMO Infant Formula. Pediatricians sometimes will prescribe this formula as a way to help sooth fussy or gassy babies. A lot of the time when babies have trouble digesting their mothers breast milk, or are allergic to something their mother is eating, or other formula, they will become fussy and inconsolable. Similac formula can stop these side effects as quickly as in a single feeding. Since the formula has 98% less lactose than milk based formulas it is gentle on your newborn’s tummy and will digest more easily, helping them pass gas and rest more comfortably. One of the ways this formula can help soothe fussy or colicky babies is by giving them constipation relief. There’s nothing more painful than a stopped up bowel movement, especially if the baby can’t communicate this to their parents. One of the most important things parents are told to watch for with a new baby is regular wet and dirty diapers. So when these stop happening they can be a cause for concern, especially in combination with a very upset infant. Using Similac Pro Total Comfort Non-GMO Infant Formula can quickly and gently help make most babies bowel movements more regular decreasing their discomfort significantly. Acid reflux can be a hard to diagnose issue that could leave your baby in a lot of pain or in some cases even have them hospitalized. Similac comfort formula combats acid reflux with their gentle ingredients, prebiotics, low level of lactose, and their unique dual carbohydrate mixture. Often times bacteria sounds like a dangerously evil thing, but there are actually types of bacteria that are really helpful in aiding with digestion and good gastrointestinal tract health. Prebiotics aid in cultivating and feeding these healthy bacteria which makes this Similac comfort formula even better for your baby. Similac Pro Total Comfort has 2′-FL HMO, which is a Human Milk Oligosaccharide. This exclusive prebiotic is found in breast milk and can help to improve your baby’s immune system and digestion alike! This formula contains 98% less lactose than milk-based formulas. This is perfect for babies who mother’s breast milk contains too much lactose or if they’re currently on formula that is milk based. When a breastfeeding mother has a super fussy baby the first way to soothe them is often by the ever dreaded elimination diet method. You remove every possible allergen from their diet and then slowly add them back in to find out what is upsetting your baby. This can be a very long painful process for the mother, baby and anyone near the fussy child. 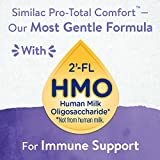 In order to avoid the inconvenience and to help soothe their baby as quickly as possible Similac Pro Total Comfort Non-GMO Infant Formula is an excellent alternative. 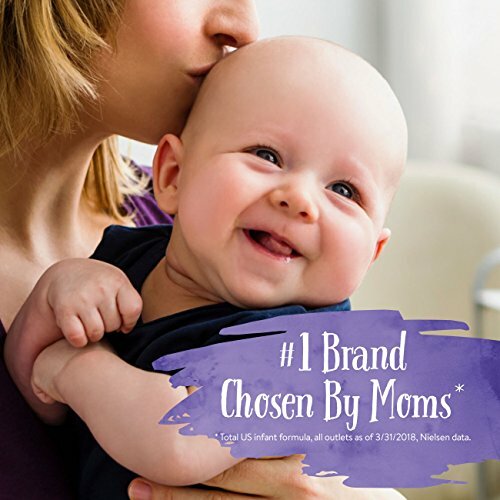 One of the largest selling points of Similac Pro Total Comfort Non-GMO Infant Formula is that if it doesn’t agree with your baby’s tummy, you can return it and try any other of their formula products for free. It takes virtually all of the risk out of this expensive formula. Similac Pro Total Comfort Non-GMO Infant Formula is easy to open and use. The lid comes completely off and there is a plastic tab you can push for easy access. You can use one hand to open the lid so that you can hold your bottle filled with water in your other hand. On the back of the formula container is a large, easy to read chart for the ratio of formula to water and how big of a bottle this will create. It also has written out step by step instructions so that you can rest assured you’re making the bottles correctly. Similac comfort formula comes in a container designed to fit your hand. It even has a nifty spot to rest your thumb so that it will be completely secure. The easy grip design enables you to tilt the container to find the scooper or to get the powder on one side for ease of scooping. All babies are different and while Similac Pro Total Comfort is an amazing cure-all drink for some babies, other babies have quite the opposite reaction to it. Because the formula is designed to decrease constipation it can go the opposite direction and make babies have massive stinky blowouts many times a day. This formula can also sometimes cause your baby’s poop to smell much worse than it ever did before, especially during blowouts. While some babies become more runny, others harden up. Constipation is another possible downside to Similac’s Comfort Formula. It is impossible to gauge what your baby’s reaction to this formula will be without trying it for yourself so in order to know if this is going to help or hurt your baby you have no choice but to purchase it, and it’s expensive. It also is primarily sold online so you may have to wait days for it to ship and get to you. Similac Comfort Formula has also caused more gas in some already gassy babies. Like any product it may work or it may not, but what you certainly don’t want is something that could make the problem worse. Is trying this formula worth the risk? Another area of heavy caution is how quickly this product must be used once it has been opened. It only has a shelf life of one month after it has been opened which means at most you can only use this formula for 4 months since it comes in four separate containers, even if you have powder left over. This makes it not ideal for parents who use formula as a supplement to breastfeeding or baby food. It also means that if you want to have two packs open, for example one at home and one at daycare, you will go through it all twice as quickly. While Similac Pro Total Comfort Non-GMO Infant Formula advertises being Non GMO as a huge selling point, sometimes the GMO material simply works better for your baby. Parents who used this formula before and after it switched to Non GMO have stated that they had to switch to a different formula because the Non GMO formula simply didn’t work. If you like non-GMO options, be sure to check out our Best Organic Baby Formulas. Newborns have minds and bodies of their own and sometimes this product simply doesn’t work for them. Either they can’t stand the taste, it makes them fussy, it causes their stomach to become upset, or it causes huge bowel movement issues that do more harm than good. While it has many great selling points, at the end of the day if your newborn doesn’t like the gentle non GMO probiotic mostly lactose free formula, they just won’t drink it. Last, but certainly not least, the Similac Pro Total Comfort Non-GMO Infant Formula with Iron Powder is very expensive. Coupled with the fact that an open container only lasts a month you could be spending an outrageous amount of money on this formula. Since the Similac milk may or may not work, it is quite expensive to just get and to try. This is where the handy-dandy Amazon trick comes in. When you grab your Similac Pro Total Comfort formula from Amazon, be sure to click the “Subscribe and Save” option. You’ll get your baby’s formula for as cheap as humanly possible, PLUS you’ll never run out. That means that each month when your open can is done, you’ll have another one ready to rock. If my baby ever becomes fussy and inconsolable I will definitely be willing to give Similac Pro Total Comfort Non-GMO Infant Formula a solid try! Though parents have noted some issues with it, for the vast majority of parents this formula is a life saver. It may be expensive, but can you really put a price on a happy infant? The Best Baby Thermometer – Which is Easiest and Most Accurate? Thank you so much for this review! It has helped a lot with the issues I’m having with my 3 week old. That’s nice to hear Mylene! What formula are using and what has been your experience with it? This formula really helps my baby’s constipation dissapear at the second day of the change. Because I was using Similac Advance , the blue one, since she was born and after 6 weeks she started with constipation.She was taking 3 days without doing poop. Can you do a reviewer i use total confort after trying about 5 this one works but i was told target no longer havet. Since Similac is coming out with a new one called pro total confort. I feed one 4 oz bottle of Total Comfort per day and the rest is Gerber Soothe. The Total Comfort really helps with constipation! If I skip the bottle of TC, she skips a day of poop. I contacted Similac and their smaller cans of Total Comfort Powder are NOT non gmo, they said parents requested to still have a gmo formula because it’s cheaper.. yeah like $2. Shame on Similac! I just switched my son and it seems to be helping with his gassiness but it is very bubbly. Is this normal? I didnt notice the bubbles when I was mixing it to get him used to it but now its like the whole bottle is full of bubbles even after sitting for a few minutes.